It’s only when he takes his helmet off that the world can see what makes Julian Edelman truly unique. He has a spectacularly bushy beard. You can see it spilling out of his chin strap. He looks like he should fell trees in an Oregon forest with an L.L. Bean shirt and a hat with ear flaps. Think Rutherford B. Hayes in a New England Patriots helmet. It’s that eccentric look, his desire to accent his individuality, that first attracts you to him. But its how he plays and how he freely expresses himself that’s always helped him stand out amid the media scrums of Super Bowl week. Edelman and the Patriots are back at it again. Super Bowl LIII on Sunday against the Los Angeles Rams is their third straight and ninth since Bill Belichick and Tom Brady pledged to love, serve and obey in 2001. And as much as anyone in uniform, Edelman understands how distressing New England’s reappearance is for some. It was he who coined the manta “BetAgainstUs” deriding the Patriots status as underdogs to the Kansas City Chiefs in the AFC Championship game. “I’m not really worried about that [the hatred of the Patriots],” coyly said Edelman. “ I’m more worried about the Los Angeles Rams and their defense and their schematics. …That’s the stuff that you’re thinking about because you know they’re thinking about you. For Edelman, this is the apex of a two-year odyssey that began with missing the 2017 season with a knee injury and continued with serving a four-game suspension for failing an NFL drug test. But once he returned, it didn’t take him long to regain his status as the go-to receiver for his must-see quarterback. 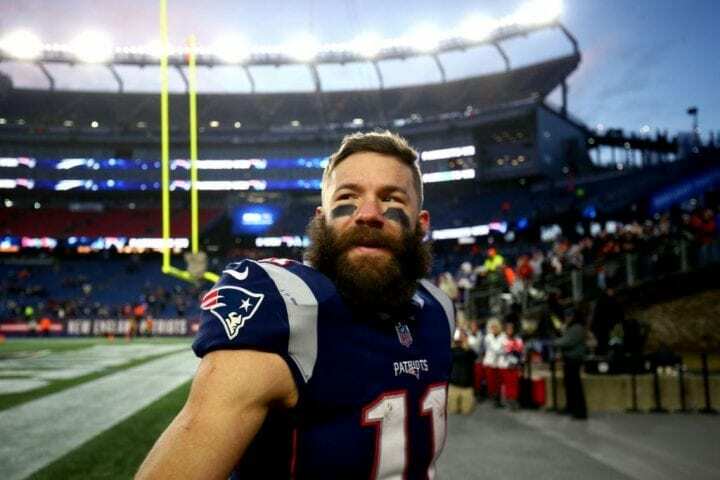 This is what Edelman means to the Patriots: Only the iconic Jerry Rice has more postseason receptions than Edelman, who was college quarterback at Kent State. Rice has said some very complimentary this about Edelman recently. “I’ve got to live up to it now, right?” said Edelman. “When Jerry Rice says stuff like that, that’s an honor and that’s an unbelievable thing. I’m from the Bay Area. I spent my childhood loving the Niners and especially a guy like him. That’s cool but honestly, my focus is on the Los Angeles Rams. I’ve been through this whole thing and the whole media storm and you’re so programmed to, “Alright, next.” You see it and you giggle but you’re thinking about the Rams”. 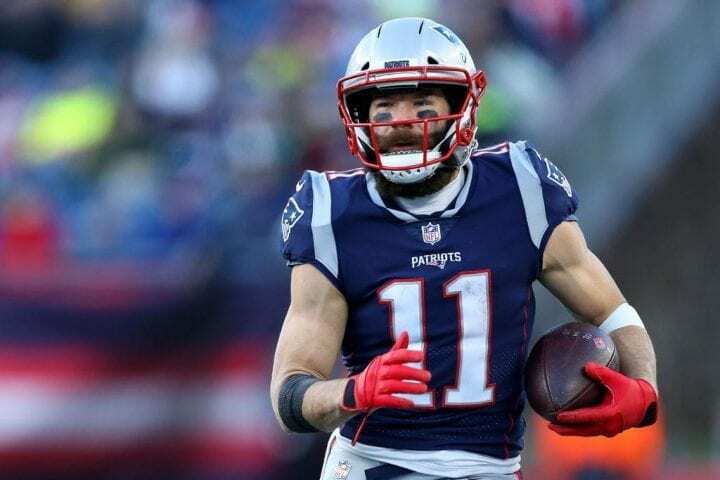 When he runs onto the field in Atlanta on Sunday, Edelman will have already made 105 catches for 1,271 yards and five touchdowns in 17 playoff games. When you think of those numbers in terms of a complete regular season, those are certainly Pro Bowl stats. In his last two Super Bowls, against Seattle in 2015 and Atlanta in 2017, Edelman has 14 catches for 196 yards and a touchdown. And he makes most of them darting into open seams in the middle of defenses, precise in his route-running and uncaring about the punishment defenders are poised to deliver. His nickname is The Squirrel because he’s always scampering around trying to find nuts. As Edelman mentioned, one of the reasons he and Brady have such chemistry on the field is their ability to playfully, but sometimes intensely, poke at each other. This will be Edelman’s fifth Super Bowl since he came to the Patriots in 2009. And while Belichick continues to shuffle personnel, he has left Edelman alone because he knows his team seldom gets where it wants to go without him.